After a serious article on Việt Nam’s development issues, a more lighthearted one with some practical recommendations and tips for those planning to visit this fabulous country soon. The info below is current as of January-February 2019. Everything you hear and read is true. You face a tidal wave of motorcycles, scooters, and other vehicles when you want to cross the street and traffic lights are rarely respected. Wait for an ever so light opening and walk across steadily, at an even pace, looking at the oncoming traffic. Never stop or change pace, go slow and steady! If necessary, lift your arm slightly, palm down, and wave — the signal you are asking them to slow down. To get the hang of it at the beginning, just follow a local to cross the street. Quickly, you’ll become a pro. I did not see a single pedestrian accident in a month, and I was walking over 10 kms a day. With the exchange rate at about 23,000 VND (Vietnamese dong) to the USD and 29,000 to the Euro, it’s fun becoming an instant millionaire. Dealing with wads of bills, though, can be a pain. Take a page from how local storekeepers deal with it. They sort in packs of 10 bills: 9 + the last one folded over neatly, the stacks ordered by the value of the bill: 1,000; 2,000; 5,000; 10,000; 20,000; 50,000; 100,000; 200,000 and 500,000. Bills of 200 and 500 VND are still around, but you don’t see many of them. Some bills are easy to confuse (notably the 10,000 and 100,000 and 20,000 and 200,000), but I’ve found people to be honest if I made a mistake. Prices are usually written and expressed minus the thousand. Say you are asking how much a coffee costs and you are told 15, it’s 15,000 VND, not 15 VND. At perhaps a 100 VND/$-difference among banks, it’s not worth your time trying to find out where to get the best exchange rate. Banks, authorized jewelers, and major hotels are the only places authorized to change currency. Hotels will offer a slightly lower rate for the convenience. Surprisingly, HSBC refused me service because I don’t have an account with them! Have your passport handy, it’s usually required to change funds. To withdraw from an ATM, opt for Agribank, Mbank (Military Bank), and Vietcom Bank which charge a lower fee. I’d researched the heck out of that before leaving and still did not have current, solid information. Even tourist sim cards are required to be registered now (to fight sim card theft?) and it would seem only official network stores can do that. Without registration, there is a risk service be cut before your plan runs out. My traveling pal and I decided ahead of time to use different networks to make sure one of us would have service no matter how off the beaten path we went. She picked up her Viettel (Ministry of Defense network) at the airport, the seller didn’t even ask for her passport and clearly her sim card was not registered. She was lucky, it worked flawlessly the entire month. I opted for a Vinaphone (Ministry of Telecommunications network) plan at an official store and went through the formal paperwork. The main difference in our experiences is Viettel inundated her with text messages the entire month. I only received a few promotional offers from Vinaphone the last week, in case I wanted to extend my plan. Wi-Fi is available all over Vietnam, but connecting to it can be iffy and, lest you go through a VPN, not safe. For a few bucks (approximately $15-20 for a month of generous to unlimited data and some local and international calling credits you can top up if needed), it’s not worth penny pinching! and a multi-function pocket knife. My friend had also brought a mosquito net and I will be adding that next time — not all places in the countryside had netting! We both brought powerful anti-mosquito products and hardly used them at that time of year. Don’t bother with an umbrella or rain jacket: go local and pick up an áo mưa — a very light rain poncho — when you get there. In major cities, if menus and goods list prices, that’s what the cost is for anyone — local, Việt Kiều, or tourist. Which doesn’t prevent you from bargaining if you like, especially if you are planning to buy multiples of whatever item. If prices are not marked, the price quoted will likely vary depending on the seller’s appreciation of what you are willing to pay (and not just because you are a foreigner). 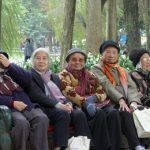 Bargaining is expected and works best if you make an effort to kick off the discussion in Vietnamese (learn your numbers!). Start at half of what is asked and work from there. Enjoy the occasional high drama. Sometimes, the vendor refuses to play ball. That happened to me only once, in Hội An, when I wanted to buy not one but four notebooks! I just walked away, and found another seller down the street. For things you are likely to buy often — a bottle of water, pack of cigarettes (no comments, please!) and some such — ask around what the usual price is and just hand that sum to the seller, no questions asked. Typically, that’ll get you credibility (someone in the know!) and open up a conversation. Once in a while, you’ll be asked for more (45,000 VND instead of 28,000VND for a pack of Marlboro’s in Sài Gòn — I laughed and walked away) and sometimes be surprised by being handed change. A liter and half bottle of water goes for 15,000 VND, a Coke usually about 17,000 VND, a local beer between 20 and 25,000 VND. Prices tend to inch up as you move North. The pack of Marlboro’s were a standard 30,000 VND in Hà Nội, the Coke 20,000 VND usually and a city bus ticket was 7,000 VND instead of 5,000 VND in Sài Gòn. There are bus apps for both cities that work well and make getting around a breeze. Grab is the Asian version of Uber and I found it reliable, economical, with excellent communication (driver’s name, picture, license plate and vehicle model). You do not have to input your credit card number and can pay the rate announced *prior* to confirming the booking in cash. No haggling. No surprises. No meter issues. Tap water or no tap water? While I wouldn’t drink tap water (hotels, hostels, taxis provide small bottles anyway), it’s up to the individual whether to use tap or bottled water to brush your teeth and so on. I did, even in the most remote parts of the northern provinces without issue. The friend I was traveling with played it safe and stuck to bottled water. We both had brought travel water filtering systems with us just in case. Frankly, given the availability of bottled water all over the country, it’s something you can do without if you want to travel lightly. I have a lousy back that cries out for skilled massages, something hard to come by and frightfully-expensive in France. I’d planned on indulging *at least* once a week during my travels, yet time constraints limited me to two massages and one facial. Bliss. Walking around any major city, you’ll be asked all the time if you want a massage. Do your research and choose reputable professionals. Also, the price of massages appears oh so inexpensive. Know that a hefty tip is expected; your tip is the masseuse’s income. Some professional outfits make clear their posted prices include tips, as is the case for Temple Leaf in Sài Gòn I can recommend wholeheartedly. They were terrific and got me over jet-lag fast. You can find the usual trinkets and souvenirs just about anywhere, stores and markets, but if you are looking for more unusual handmade items to bring home, here are a few recommendations. An absolute must is Mekong Quilts (flagship store in Sài Gòn; locations in Hội An and Hà Nội,), a not-for-profit social enterprise that works with women in villages across the country who handcraft items for sale, all profits returning to the villages to support women’s economic development, health, and education. Their slogan is “the gift that gives twice”, and it does. Whether quilts, cushion covers, clothes, bags, scarves, stuffed animals, tableware, or even bamboo bicycles, there is something for everyone and in every price range. You’ll be sure to offer something original, handmade and that “does good” in the process. Credit cards are accepted. Mekong Quilts also has a website if one wants to order from abroad. The selection on the site is limited and prices, which include airmail delivery, are much steeper than at the stores. Once you’ve visited (and you must!) the wonderful Women’s Museum in Hà Nội, go take a spin in the gift shop. They have a wide variety of items, including fabric products made by various ethnic minorities at a very small markup over their price if bought where they were produced. You’ll surely have gotten hooked on Vietnamese coffee and wishing to take some home. I left that to the end of my trip to avoid lugging supplies through the country. I’d been told to avoid the tourist traps in Hà Nội’s Old Quarter and play it safe going to Trung Nguyên. Not keen on chain stores in any country, I sought these five lovely ladies’ advice one morning. After huddling and discussing the question among themselves, in unison they sent me to Café Mai. They’ve been in business since 1936 and let me sample several beans before making my choice. If you are not going to the Central Highlands where coffee is grown, Mai is top choice. 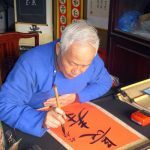 For an original gift that carries meaning, stop by the calligrapher’s stall when you visit Văn Miếu, the Temple of Literature, the country’s first university in Hà Nội. It’s great fun watching him work. Leaf through the catalog to choose the characters you wish him to write on your scroll. You’ll undoubtedly become friendly with a few people or some will have gone out of their way to help you. Small gifts representative of where you come from are much appreciated. For instance, I had brought some Opinel pocket knives, because they are made in Savoie where I live and are useful. Local T-shirts, baseball caps, postcards, candies and some such also make good “thank you” gifts. I’d planned this trip in the utmost detail, down to specific trains, isolated havens, and so on. Also, we’d already bought our plane tickets! While I normally fly to my destination and sort the rest once on the ground, this time I didn’t want to waste a precious minute dealing with logistics. Also, I needed help organizing a week in the most remote parts of the Northeast with a driver (and obligatory guide). I’d never worked with a travel agency save when organizing international conferences. I had a hard time finding one that truly was a made-to-measure outfit, didn’t just cobble together mini-tourist packages to produce a so-called custom trip, and didn’t impose tour guides at each stop I neither needed nor wanted. Huge thanks go to Tiphaine Leblanc at Comptoir des Voyages in Paris who took my detailed itinerary, implemented the logistics, put together a terrific week in the North, and let us reserve two places on our own Comptoir and their local service provider didn’t have relations with (normally a deal-breaker!). Tiphaine had lived in Việt Nam six months and returned often, so she understood exactly what I sought and especially what I wanted to avoid. Everything went like clockwork. I cannot recommend her and her team enough.